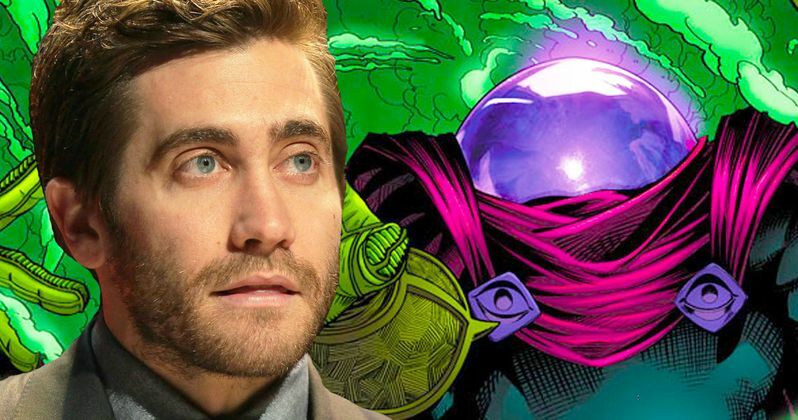 Mysterio is coming to the Marvel Cinematic Universe, and it looks like Jake Gyllenhaal is going to be the one playing him. According to a new report, the Nightcrawler and Brokeback Mountain star is getting ready to enter the superhero world as a villain in Spider-Man: Homecoming 2. We should note that Gyllenhaal is merely in talks right now, but it sounds like this is actually going to happen and would mean that this sequel will have an excellent actor on board to play its big bad guy. Previously, it was reported that Matt Damon passed up on the chance to play a villain role in the upcoming sequel. It would seem logical to assume that Mysterio is what he passed on. So, the ball is now in Jake Gyllenhaal's court. Interestingly enough, Gyllenhaal was rumored to be in discussions to take over the Batman role if Ben Affleck decides to step away. However, the actor clarified that isn't going to be the case. Instead of joining the world of DC as the Caped Crusader, he is going to be joining the world of Marvel as the master of illusion. For quite some time, fans have wanted to see Mysterio make his way into a Spider-Man movie. The character was created by Stan Lee and Steve Ditko, first entering the pages of Marvel Comics in 1964's The Amazing Spider-Man #13. Ever since, he's been a regular foe for Spidey. While Mysterio doesn't possess any actual powers, he is a masterful designer of special effects and illusions. He's also a master hypnotist and magician and an amateur chemist and roboticist. To boot, he has extensive knowledge of hand-to-hand combat techniques. This makes him a unique and pretty interesting bad guy. Not only that, but his costume is very much something that works well in the pages of a comic book, as he wears an all green spandex suit, a purple cape and big dome that looks like a fishbowl on his head. But can that work on the big screen? It's completely unclear whether or not Marvel Studios and Sony will remain faithful to the costume, but having Jake Gyllenhaal under the (possible) dome is a good place to start. The Spider-Man: Homecoming sequel is set to begin filming this summer for a July 5, 2019, release. Tom Holland, who started life as the MCU's webslinger in Captain America: Civil War and recently reprised the role in Avengers: Infinity War, is scheduled to reprise the his role. Though, there are currently a few questions about that, given the events of Infinity War and the pending events of Avengers 4. Jon Watts, who directed Homecoming, is returning this time around working from a script penned by Chris McKenna and Erik Sommers, who were two of the screenwriters credited on the last movie. Back in the Sam Raimi days, Jake Gyllenhaal actually almost took over the role of Peter Parker in Spider-Man 2 when Tobey Maguire injured his back filming Seabiscuit. So he has an interesting history with the franchise. Let's hope nothing gets in the way of this deal actually getting done so we can start imagining what those set pics of Gyllenhaal in costume are going to look like. This news comes to us courtesy of The Hollywood Reporter.